- วัดนอกได้ 0-300 มม. และวัดรูในได้ 3.5-300 มม. 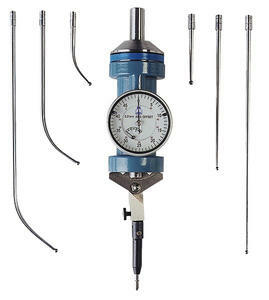 -Universal equipment for finding the centre of a bore or to measure the concentricity of work pieces. -Indicator always faces operator, also when spindle runs. -With double indicator for maximum accuracy. -For vertical and horizontal use. -Includes 6 touch points for internal and external measurement.